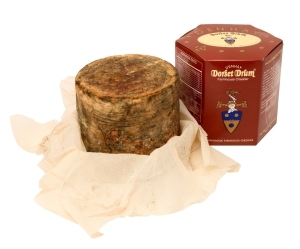 The Denhay Dorset Drum Cheddar was developed over thirty years ago as a smaller version of the Denhay Traditional 27kg rinded cheddar. Ideal for cheese boards or as a gift for discerning foodies, this 2kg mini truckle is hand made in the same way as all Denhay’s West Country Farmhouse Cheddar, but matures differently. Sold at between 7-12 months, it never becomes a very strong ‘roof-off-the-mouth’ cheddar, but develops its own distinctive cheddar flavour, found only in a small truckle. The Denhay Dorset Drum comes in an attractive box, relating the history of the company and the origin of the name – Dorset Drum – which was conceived from a naval drummer boy who would have been on a ship in Admiral Lord Nelson’s fleet, commanded by an ancestor of one of Denhay Farms’ partners, Henry Hood. Denhay Cheddar is made using only milk from Denhay’s own cows. It is hand-made on the farm to traditional methods, and then matured on age-old wooden shelves. The natural micro-flora in the Cheese House built up over the 50 years they have been making West Country Farmhouse Cheddar ensure the unique character of the Dorset Drum, giving it a smooth creamy character with a nutty rounded flavour. The Denhay Dorset Drum Cheddar is available to buy in selected independent stores and delis in the UK, and online through www.denhay.co.uk (UK delivery only).